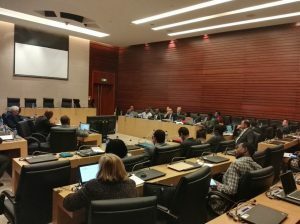 The African Society for Laboratory Medicine (ASLM) was selected to serve as the focal point for the Public Health Laboratory Leadership subcommittee of a new task force formed at the recently held Africa Centres for Disease Control (CDC) Workforce Development Strategy Planning Meeting with Partners. The meeting was held 16-17 November 2017 at the African Union headquarters and attended by Dr Ali Elbireer, CEO of ASLM, and Dr Amha Kebede, Program Manager and CDC PEPFAR Program Coordinator, who represented ASLM. Africa CDC supports capacity development and offers technical expertise for effective responses to public health emergencies in member countries. The long-term strategic approach of Africa CDC is the support of sustainable development of the public health workforce through partnerships and in synergy with already existing initiatives. 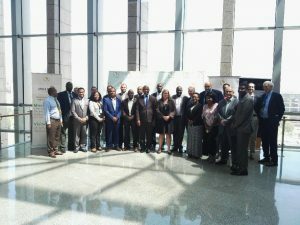 It was with this understanding that Africa CDC organized a two-day consultative workshop to brainstorm on strategies for public health workforce development, including human resources for laboratories. The main objectives of the workshop were to identify existing capacities and areas of collaboration and partnership, and to discuss the development of a manual for the workforce development agenda. Representatives from 14 international global health organizations, including ASLM, participated in the discussion. The workshop was chaired by Dr John Nkengasong, Director of Africa CDC. In his opening remarks, he emphasized the importance of the public health development program and the role of Africa CDC to respond to anticipated needs over the next several decades. The most critical of these include the projected growth of the African population to 2.5 billion people by 2050 and projections for the burden of disease in Africa by 2030. In addition, he noted the importance of alignment with the ambitious goals of the African Union’s Agenda 2063 for disease control and the objectives of the Africa Health Strategy 2016-2030. Following a comprehensive discussion on the workforce agenda, the 14 participating organizations formed a task force comprising three subcommittees mandated to develop the public health workforce strategy: the Laboratory Leadership Training Programme, Public Health Informatics Programme and Epidemiology Training Programme. The task force is expected to address career path, placement and positions of laboratory personnel. It will also create an inventory of short courses and other trainings available in Africa and consider the creation of an Africa CDC institute or academy to provide both short- and long-term trainings. During the discussions, ASLM was selected to serve as a member of the task force as well as the focal point for the Public Health Laboratory Leadership Programme. ‘The Public Health Laboratory Leadership Programme is very much in line with the ASLM’s vision in the area of workforce development,’ said Dr Dr Ali Elbireer, who assured the task force of ASLM’s full commitment.